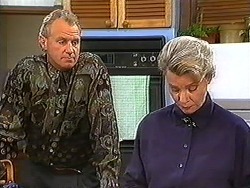 Jim tells Beverly that he's come to accept that their marriage is over. He admits that he's been attracted to someone else and doesn't think he could have been if he still loved Beverly. Beverly is shocked, but tells Jim it's his own business. She asks Jim to come to Todd's court case next week to give the impression of family support. She'll pick up the rest of her stuff whenever she can. She leaves and bursts into tears on the doorstep. Caroline moans about the mess Paul has left in the kitchen. Paul is having a rare Saturday off. Harold and Sky are cleaning the kitchen. Harold tells Madge that he's not sure about her buying Toby a toy gun - Kerry doesn't like guns. But Madge doesn't think it'll be a problem, it's only a toy! Gemma comes out - Helen has invited her to lunch today. Madge gets a letter - a quote from Dorothy for $250 for damage to her car and bike! Gemma says she'll pay Dorothy off. Madge is cross, but Harold agrees with Gemma - there's no point carrying on a feud. Madge rips the letter up! 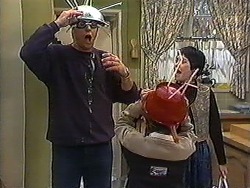 Toby and Joe are playing aliens with colanders on their heads. 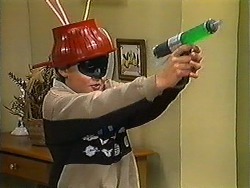 Kerry isn't pleased to see Toby's slime gun, and says the gun will have to go. She's also not pleased to see Sky with cleaning stuff, saying she doesn't want Sky to be conditioned into doing housework. Joe says Kerry had better not tell Madge she's taking the toys away. Jim brings Helen in some carrots to make for lunch. He tells Helen that his talk with Beverly didn't go quite the way he thought - Beverly didn't seem phased by him seeing someone else! Helen isn't pleased to hear that Jim won't be there for lunch with Gemma - he's going out with his mystery woman instead! Jim has come around to see Caroline. 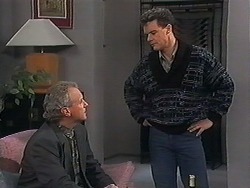 Paul tells Jim off for not going to the lunch with Gemma - he thinks that Jim is going through a mid- life crisis. He tells Paul to keep his opinions to himself. Harold, Madge, Helen, Paul and Gemma are sitting down to lunch. 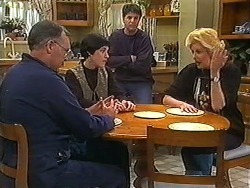 HELEN: Gemma, welcome to Ramsay Street! Apparently Rosemary and Tracey have gone to a solo guitar recital. Matt arrives and Gemma feels very awkward at his presence. Toby is off sulking about his gun, but Kerry says it's tough. Beverly comes around for a chat with Kerry. She tells Kerry that Jim has found someone else, so she didn't tell him about the baby. Kerry says she'll have to tell Jim at some point, but Beverly says she doesn't want to bribe Jim back to her. Jim and Caroline are having lunch. 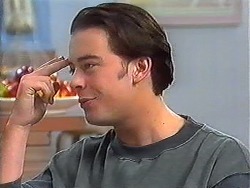 Jim is preoccupied about Beverly and tells Caroline that it isn't easy walking away from a marriage. Caroline thinks Beverly will cope fine. Everyone is talking about children's toys and their appropriateness. Matt and Gemma are sniping at each other and Harold intervenes, telling them to stop. Matt decides to leave. 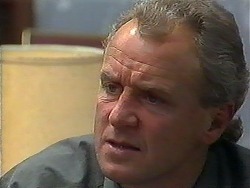 When Matt has gone, Harold tells Gemma that her behaviour is not acceptable - she must apologise to Matt about the bike. Toby is playing guns with a banana(!) and Kerry isn't pleased. She explains that the idea of guns is all wrong - he has plenty of other things to play with. Joe isn't sure about Kerry's stance, but goes along with it. Caroline and Jim are out jogging - Jim looks knackered! He sits down and Caroline jogs off for another lap. Helen has come to see Beverly. They talk about Jim seeing someone else. 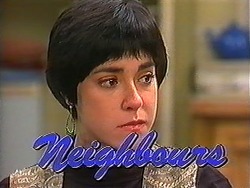 Just then, Beverly has a twinge and is forced to admit to Beverly that she's pregnant. Helen says it's wonderful, but Beverly says that she doesn't want an empty marriage - she can't tell Jim. BEVERLEY: Helen, you must promise me that you won't tell Jim. Harold and Madge are doing some gardening. Harold sends Gemma off to apologise to Matt. Toby comes over and tells Madge that Kerry took their toys off them. Madge storms off to No.32 and Harold follows her. Gemma is apologising to Matt. They agree to bury the hatchet. Kerry is explaining that she doesn't want her kids gender stereotyped. Harold tells Kerry that she might be getting a bit carried away, but Kerry says that she always wanted trucks and things as a child - all she got was a tea- set! Kerry suggests that she gives Madge the toys back and she can exchange them for something else. Madge is not pleased and smashes the gun on the floor.